Although the performance of communication satellites could be predicted theoretically, until 1962 or 1963 there was considerable doubt concerning whether their actual performance would match the theory. This was one of the basic motivations for the early communication satellite experiments. Two other important factors were the desire to prove the satellite hardware (since space technology in general was still in its infancy) and the need to test operational procedures and ground equipment. Whereas the first few experiments (SCORE, Courier, and Echo) were very brief beginnings, the Telstar, Relay, and Syncom satellites laid definite foundations for the first operational satellites. Communication satellites have been in commercial operation and military service since 1965 and 1967, respectively. However, there was, and still is, the need for additional experimental satellites. These are used to prove new technologies for later introduction into operational satellites. Some satellites combine experimental objectives with preoperational demonstrations. Discussions of such satellites are included in this chapter if their emphasis is primarily experimental; those directly continued by operational satellites are described in later chapters. The objective of the Courier program [13] was to develop a satellite of higher capacity and longer life than SCORE, which could be used for communication tests and assessments of traffic handling techniques. The concept was similar to SCORE in that the primary operating mode was store-and-dump using onboard tape recorders. A real-time mode was also available. Unlike SCORE, Courier was a self-contained satellite and had both solar cells and rechargeable batteries for power supply. Except for the final amplifiers of the transmitters, the electronics were all solid state. The details of Courier are as follows. The Courier communication subsystem had four receivers, two connected to each antenna. Signals received through the two antennas were summed in a baseband combiner. 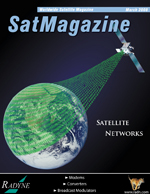 The satellite could support a single half-duplex voice circuit in the real-time mode. One analog and four digital recorders, each with a 4 min recording capability, were used for the store-and-dump mode. This allowed any ground terminal to use the satellite for transmission of four separate digital (multiplexed teletype) messages, one to each of four other terminals. Upon command, a recorded message (or the received signal in the real-time mode) would modulate two transmitters, one connected to each antenna. The satellite also had two spare transmitters. The two carrier frequencies were separated about 20 MHz. Various signal-combining techniques were used at the ground to make use of these two signals. The first Courier launch was unsuccessful because of a booster failure. The second, in October 1960, was successful. Two ground terminals, located in New Jersey and Puerto Rico, performed communication tests. The satellite performed satisfactorily until 17 days after the launch, when communications were stopped by a command system failure. Donald H. Martin is a senior engineering specialist in The Aerospace Corporations Architectures and Spectrum Management Office. Martin joined the Communications Department in the Engineering Group at Aerospace in 1968 after receiving B.S. and M.S. degrees in engineering from the University of California, Los Angeles. He has been collecting information on satellite communications since 1972, when his manager offered him a choice of assignments: of the three options, he chose to write a description of communication satellites then in orbit. The assignment grew the next year to include a report describing satellites being built, and gradually expanded to the first edition of Communication Satellites in 1986, with the book now in its Fifth Edition. 1. G. F. Senn and P. W. Siglin, Courier Satellite Communication System, IRE Transactions on Military Electronics, Vol. MIL-4, No. 4 (October 1960). 2. P. W. Siglin and G. F. Senn, The Courier Satellite, Communication Satellites, Proceedings of a Symposium Held in London, L. J. Carter, ed. (1962). 3. E. Imboldi and D. Hershberg, Courier Satellite Communication System, Advances in the Astronautical Sciences, Vol. 8 (1961).